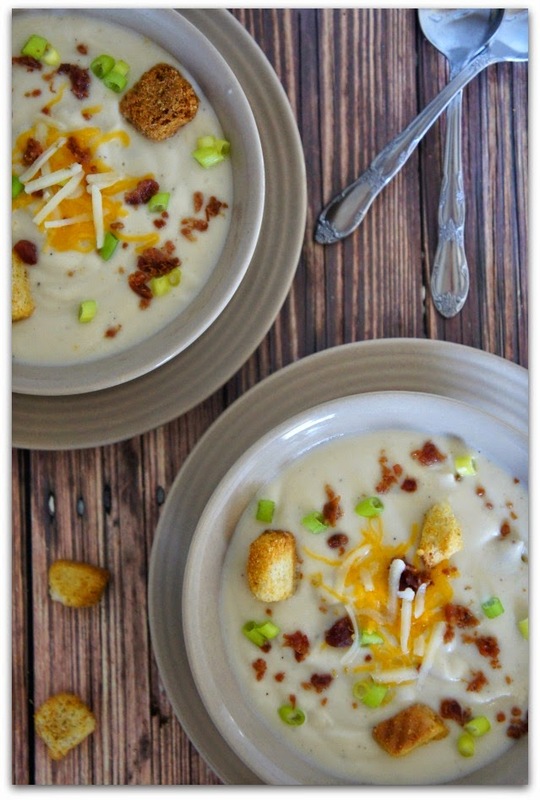 A creamy, cheesy, crockpot cauliflower soup that is similar to the version served at Cafe Zupas. 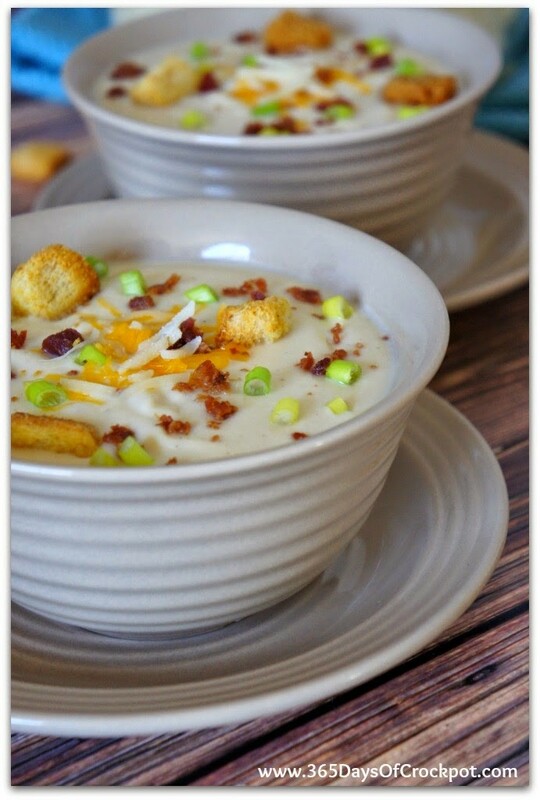 This soup is best when served with crumbled bacon on top! The other night I went to Zupas (a really great cafe with soups, salads and sandwiches) with my sister-in-law. She convinced me to get a sample of the Wisconsin Cauliflower soup. I was a little skeptical of cauliflower soup but gave it a shot. It was creamy and totally delicious. 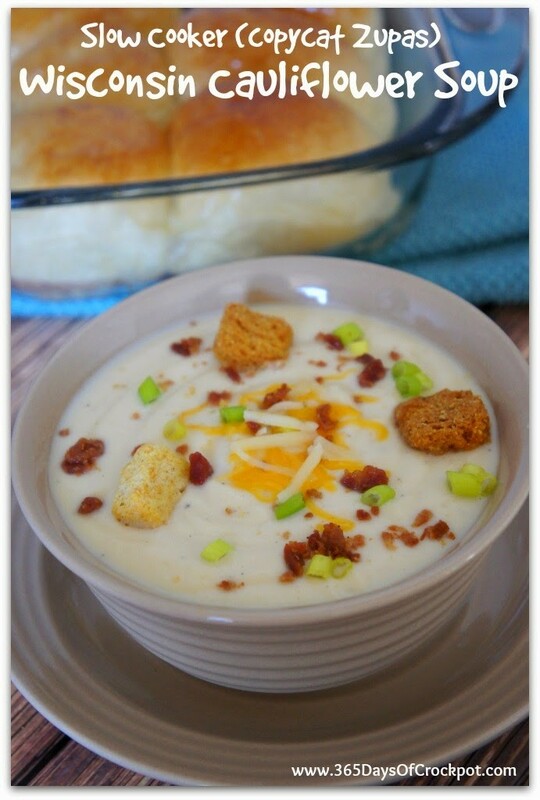 I was convinced that I needed to make a version of this soup in my slow cooker. I had to make it two times to get it right, but I did it! The first time I tried making the soup I decided to throw the onions in raw. They totally overpowered the soup and it just did not work. The second time I took a few minutes and sautéed the onions in butter and then added them to the cauliflower in the crockpot. Bingo–perfect flavor combination without any overpowering flavors. I really try to keep my recipes to as few as steps as possible because I like to save time; however, with this recipe you really do need to take the extra step to sauté the onions. Believe me, it’s worth it! My whole family loved this soup. I kept telling them that they needed to save me some to photograph! 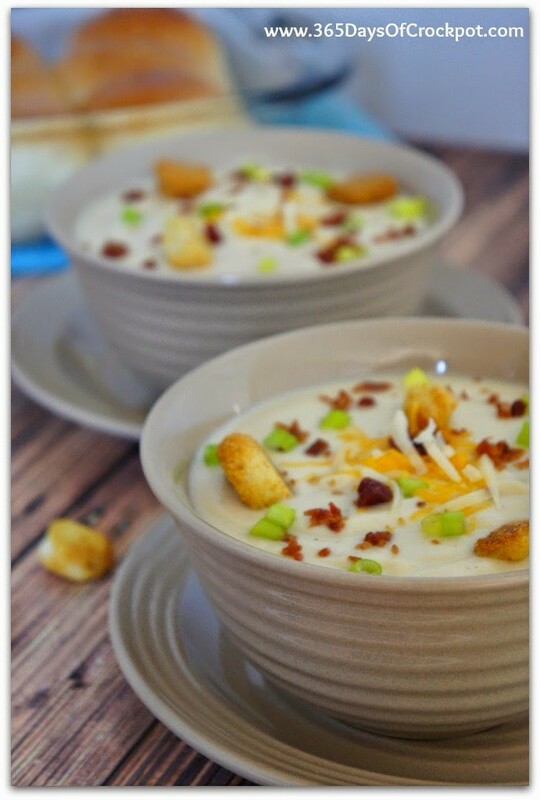 They loved the soup with a few croutons and, of course, crumbled bacon is never a bad thing. Personally, I like my soups with some texture in them so I’d prefer to leave some cauliflower chunks in there instead of pureeing it all. But to keep it true to the version at Zupas I pureed it all. I served my kids the soup with a diced baked potato in it…just for a little more sustenance. I hope you like this soup as much as we did! and butter to slow cooker. 2. Cut the cauliflower into florets. (They don’t have to be super small since you’ll be pureeing it later). Add the cauliflower to the slow cooker. pepper to the slow cooker. 6-8 hours or on HIGH for about 3-4 hours, or until cauliflower is very soft. of slow cooker into a large blender (you may have to do this part in batches). Puree until creamy and smooth. Add back into the slow cooker. slow cooker. Stir in the Dijon mustard and cheeses until they are melted. P.S. Try these other copy cat recipes too! This is AMAZING!!!!! I love Zuppas and made this just hoping and WOW!!! LOVE IT LOVE IT LOVE IT!!! Karen, you nailed it! I didn’t use the slow cooker, I just simmered the onions and cauliflower in a pot until tender and followed the rest of the instructions and it was creamy deliciousness! I made this, its outstanding! To me, it’s a great replacement for potato and cheese soup, it tastes the same. I used pre-chopped cauliflower pearls because I happened to find them on sale when I was looking for heads. I did notice everything seemed “done” around 4 hours, so I blended it then. Is there a particular reason you don’t add the heavy cream and mustard before blending? Or is that just to cut down on the amount of liquid you have to blend up? Thank you for this recipe, love it! Thanks for your comment! I don’t add the cream because it will curdle. The mustard would get bland with all that slow cooking so I add it at the end. Glad you love it!! made this tonight for my dinner and it was so delicious. I am vegetarian, so I used veggie broth instead of the chicken bouillon and water. I also made some coconut bacon and used that and some croutons to top the soup. Thanks so much for a great recipe! Wow! I’ve never heard of coconut bacon before. What is that? Yes frozen would be fine and no you wouldn't need to thaw it! Could you use frozen cauliflower? And would you have to thaw before using in this recipe? I wouldn't worry about thawing it! Could you use frozen cauliflower? What is the nutrition facts on this? Hmmm, I don't know if it would work because the cauliflower would be raw. You could try it and see though! Do you think you could blend the cauliflower before you put everything in the crockpot? Recipe looked great. I added in some garlic with the onions, fresh thyme with the slow cooker, and horseradish when serving and it was really good. i made a similar soup recently and found that after 6-8 hours in the crockpot, the onions and cauliflower turned a light brown color. When pureed it was rather unappetizing to look at (although delicious.) Does the cream combat that, or should i keep a watchful eye on the crockpot and just puree the soup when the cauliflower is soft but not yet browning – which i suspect could be as little as 4 hours? Hi Jennifer, I think that is a smart idea! Do that! Made this tonight for my family and the missionaries and it was great! I used an immersion blender and it still was smooth and creamy. I was in Utah over the summer and had some of this soup at Zuppas, now I'm so glad I can re-create this. You are amazing Karen! I'm ready for a bowl of this soup right now! Looks so delicious. Would you recommend keeping everything in the crockpot and just using an immersion blender? you could totally do that. I have an immersion blender but I prefer to put everything in my big blender because I feel like it gets more creamy. Totally up to you!